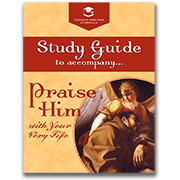 Don’t let your student miss the meaning of the spiritual gems woven throughout the delightful plays contained in Praise Him with Your Very Life! This study guide includes comprehension questions, vocabulary, creative project ideas, and a complete answer key for all six plays. 95 pgs. 8½"x11" Loose-leaf drilled, shrink-wrapped. For a detailed daily lesson plan for the study guide and first four plays, see CHC Lesson Plans for Sixth Grade.